people whose land lay between Galilee and Judea. The Samaritans were mixed-race descendants of those scattered people who remained in Palestine when the Judean Hebrews were carried into exile in Babylon. They were scorned by Judeans, due both to their mixed heritage and to their revering of Mount Gerizim rather than Jerusalem as God’s chosen worship site. Even with this change, Jesus still limited himself to people who were somehow within the Hebrew cultic tradition. However, in both Mark (7:24-30) and Matthew (15:21-28) we are told of a journey to the Mediterranean coast during which he a met Canaanite woman. From there he got up and went away to the regions of Tyre. Whenever he visited a house he wanted no one to know, but he could not escape notice. Instead, suddenly a woman whose daughter had an unclean spirit heard about him, and came and fell down at his feet. The woman was a Greek, by race a Phoenician from Syria. She returned home and found the child lying on the bed and the demon was gone. In her 2001 Ideas at the Powerhouse lecture, Elaine Wainwright, former Professor of Theology at the University of Auckland, re-imagines the story of the Canaanite woman (named “Justa” in later traditions) in the context of a story about an Australian Aboriginal woman who faced colonialist scorn. Justa’s voice is constructed by the…storyteller, who sets her story in the context of the ancient Canaanite/Israelite struggle. Jesus, whose birth and life story generally placed him among the colonised of the Roman empire, preaching a message that was counter-Imperial, is placed in this story in the role of the coloniser. He stands with and for ancient Israel, as this story evokes that of another conquest of land, namely ancient Israel’s violent appropriation of the land of the Canaanites on the grounds of its being promised as divine gift. The Jesus of this new story-telling, this shaping of a new spiritual imagination, emerges, not in doctrinal or dogmatic formulae, but engaged in the process of recognizing his own complicity in colonialism, even while steeped in a broader life vision of seeking to eradicate it. We are always unlearning and learning on this path toward transformation, and stories which remind us of this aspect of the journeying can sustain our spirits along the way. In an earlier piece written for Reading from This Place. 2: Social Location and Biblical Interpretation Internationally (Fortress, 1995, pp. 151-52), Wainwright shares her feminist take on how this story might have been viewed by 2nd- and 3rd-generation Christians in the house churches of Antioch. Some of these communities were made up mostly of Aramaic-speaking Hebrews and others, mostly Greek-speaking Gentiles. Wainwright pictures leaders of these house churches meeting to gather together their various traditions about Jesus. On this occasion, they were retelling the story of the Canaanite woman. Miriam, representing a community where Greek- and Aramaic-speaking people worshiped together, was the first to speak. She told it as the story of Justa, the woman of Tyre whose granddaughter was now a member of their community. Justa had told and retold the story of her encounter with Jesus…. Justa [had] called out for help to this itinerant Jew, who wandered into the area and who was being followed by such a close-knit group of women and men that he gave the appearance of being a holy one. How taken aback she was when she received this insulting rebuff: It is not fair to take the children’s bread and throw it to the dogs. Justa’s need, however, was greater than any humiliation she could receive and so, led by some power even beyond her own consciousness, she quipped back: Ah, but even the dogs eat the crumbs that fall from their master’s table. She remembered her own fear at the realisation of what she had just said, but also her experience of a new power which she had not known before, a power which would never again allow her to be put down in such a way. She remembered also the look of astonishment, recognition and even shame that passed across the face of the Jewish holy man whom she later came to know as Jesus. He spontaneously held out his hand to her in welcome, drawing her up from her position of supplication, and he acclaimed her: Woman, great is your faith. Miriam acknowledged that their community had extended the saying of Jesus: Let it be done for you as you desire, so as to highlight Jesus’ recognition of what Justa had taught him; a recognition that linked her insight into wholeness with that of God whose way, whose dream, Jesus was to establish on earth. Johannan, leader of an Aramaic-speaking house church, interrupted. You tell this story as if it were a story of Justa rather than Jesus. Our community is much more aware of the outrage that Jesus must have felt when confronted by this foreigner who was not only Syrophoenician—a veritable Canaanite according to our tradition—but also female. We have it on good authority from those who knew Jesus’ companions of that day, that Jesus at first ignored the woman. He was forever faithful to the traditions of his religion and he would not have spoken to such a woman in public…. Furthermore, in the story as we received it from our Hellenistic Jewish brothers and sisters in southern Syria, Jesus is reported as saying to the woman: I was sent only to the lost sheep of the house of Israel. This is a very different picture of Jesus than that presented by Miriam. Jesus may eventually have given the woman what she wanted because she was crying after them, as the disciples suggested, but the story still preserves the integrity of his mission to Israel rather than to the Gentiles, and our God-given gender distinctions. Finally Justinian, a Roman official who led a Greek-speaking community, intervened. Johannan, we have had this conversation many times before, I know, but Jesus’ own vision of his ministry was more universal than you say. This is one of our key stories which illustrate the movement within Jesus during his lifetime enabling him to see his mission as one including us. This woman, whom we don’t name and I am happy to learn her name, this woman Justa, is indeed for us the foremother of the mission which includes us as Gentiles. Just as she won healing and wholeness for her daughter, so too she won it for us, her daughters and sons today. Indeed, for us, her voice echoes the voice of the women of our community who participate in the liturgical life of the community and in our theological reflection. I hadn’t heard the conclusion to the story as Miriam has told it but I can tell you…it will be significant in our house community, and we will add it to our telling of the story, so you would do well to include it also. 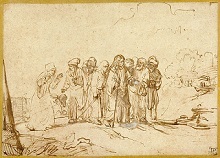 Christ and the Canaanite Woman, about 1650, Pen and brown ink, brown wash, corrected with white gouache, 20 × 27.9 cm (7 7/8 × 11 in). Unknown maker, Rembrandt Pupil, active 1650s. The J. Paul Getty Museum, Los Angeles. This image is available for download, without charge, under the Getty’s Open Content Program. This icon celebrates the richness of Syriac Christianity. The inscriptions in the upper corners read “Jesus Christ,” and at the bottom, “Christ of the Desert.” The Syriac language has ties to the earth that are deep and rich. It is more inclusive than most European languages. The theological experience of Syriac Christians is different because they have encountered the Gospel in such a language. Theirs is an unhellenized expression—one that is neither Europeanized nor Westernized. Semitic as it is, the Syriac tradition knows no dichotomy between the mind and heart. The heart is the center of the human person—center of intellect as well as feelings. The body and all of creation longs to be reunited with God. A little extra. (Nahum 3:13) Appointed time for this secret to come out. 42: Under the veil, tower sometimes represents son. Lucifer is the son of the morning, but Lucifer is not a male under the veil. There is a difference between men and women under the veil. This may be hard to want to grasp for some people, but the symbolization is sure. In the Gnostic book called The Tripartite Tractate says; (their fathers who are the ones who gave them life, each one being a copy of each one of the faces, which are forms of maleness, since they are not from the illness that is femaleness) In the Gnostic book called The Hypostasis of the Archons, it says; (Then the female spiritual principle came [in] the snake) The Gnostic book called The Dialogue of the Savior says; (“Whatever is born of the truth does not die. Whatever is born of woman dies.”) and again (The Lord said, “Pray in the place where there is no woman.” Matthew said, “Pray in the place where there is [no woman],’ he tells us, meaning, ‘Destroy the works of womanhood,’ not because there is any other [manner of birth], but because they will cease [giving birth].”) The Gnostic book called The Paraphrase of Shem says; (He humbles the dark womb in order that she might not reveal other seed from the darkness.) and again (Her likeness appeared in the water in the form of a frightful beast with many faces, which is crooked below.) The Gnostic book called The Second Treatise of the Great Seth says; (And do not become female, lest you give birth to evil) The Gnostic book called Apocalypse of Peter says; (The kindred race of sisterhood will appear as an imitation. These are the ones who oppress the brothers,) A woman is someone who is not of the Lord, while a man is someone who follows only God. The reason that this symbolization was used was because men do not want to be called women. Saying that a woman is one of the guys is not seen as an insult. Knowing that woman under the veil is someone who holds onto man’s ways is very important. These next verses show the same male and female symbolization in the Bible compared to the Gnostic books. (Jeremiah 50:37-38, 51:30) (Isaiah 3:12, 9:16, 19:16, 27:11) (Ezekiel 18:6) (Romans 1:24-26) There are few true men on Earth, but in time there will be many. (Ezekiel 34:31) People who cling to the government of man and do not want the kingdom of heaven to come are as women, and they are not to speak in the churches.